Rental located 400 m from the sea! Former penty completely renovated, work completed in May 2016. Understanding a kitchen, a living room-stay, a room, a room of bath, a terrace, a carpark, a closed and paysagé garden. You can leave your bikes in the garage if necessary. very bright living room, seaside decor! Possibility to rent them together because they can communicate if you wish. Located 400m from the sea! You can walk to the beach or walk by the sea! Ideally located in France, Brittany region, department Finistère (29), common Fouesnant (29), on the tip of Mousterlin. "In the heart of the Breton riviera"
charm of the old and comfort of the new. large kitchen fully equipped with ceramic hob, extractor, fridge, dishwasher, oven, microwave, coffee maker, kettle ect ... a large family table. Both rentals are completely new. Maximum capacity: 17 people T4: 10 people (+3 cots) T2: 4 people (2 adults + 2 children + 1 cot) Possibility to rent separately (the privacy of each is preserved) or together because the cottages can communicate if you wish. 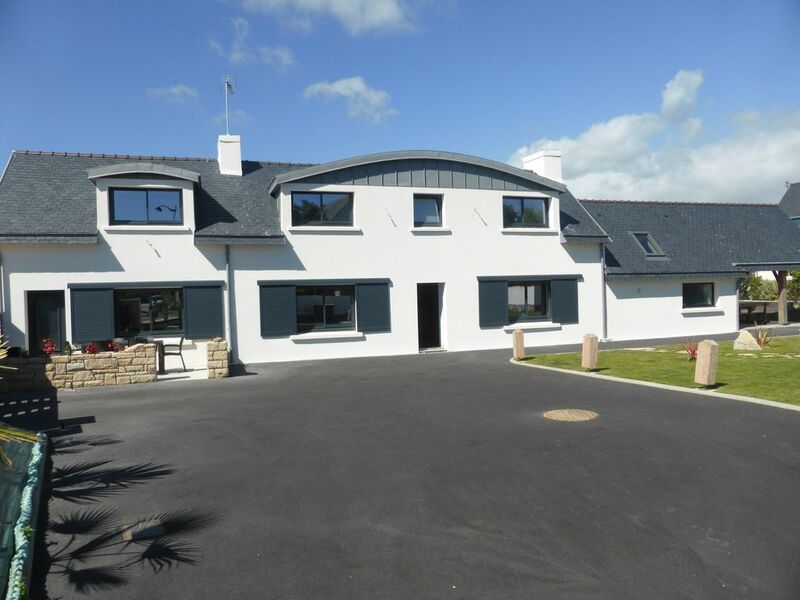 This is a Breton penty, renovated, old charm and modern comfort, work completed in May 2016. Wir hatten als Paar die kleinere der beiden Wohnungen. Top-Zustand, geschmackvoll eingerichtet, tolle Lage (3 Minuten mit dem Fahrrad zum Bäcker, kurze Entfernung zum Strand) und ein freundlicher Vermieter, der gute Tips für Unternehmungen in der näheren und weiteren Umgebung gab. 100% Weiterempfehlung, auch für größere Familien/Gruppen geeignet, da sich beide Wohnungen miteinander verbinden lassen. Merci Monsieur Mölbert pour votre appréciation sympathique. Merci Monsieur Maucotel. A bientôt . Peut-être au mois d'Avril.. Location spacieuse, bien agencée, très propre, bien située géographiquement, au calme, avec commerces et restaurants à proximité. De bons renseignements et d'endroits à visiter reçu par mail par le propriétaire et accueil chaleureux et convivial à notre arrivée. Accueil chaleureux. M. Planchais est soucieux du bien être de ses locataires. Il nous a donné de multiples brochures et cartes touristiques et nous a montré comment décortiquer des araignées. Le logement est conforme aux photos et très propre. Les prestations sont d'une grande qualité. La région est splendide. Il y a beaucoup d'endroits à voir. Nous vous remercions pour cette appréciation :) à bientôt! Agréable séjour qui a commencé par un accueil vraiment chaleureux du propriétaire. Le penty T2 est entièrement rénové et très bien équipé. Le logement est proche des plages et des sentiers de randonnée. Si vous possédez un vélo n'hésitez pas à le prendre, il y'a des belles balades à faire. La petite terasse est très agréable et le jardin est clôturé, la voiture est garée dans la cour. Nous recommandons vivement ce logement! Un grand merci pour votre appréciation! Superbe penty entièrement rénové et décore avec goût. Idéalement situé sur la pointe de Mousterlin près des plages et des sentiers de randonnée. Un accueil très chaleureux du propriétaire. Le gîte est très confortable et fonctionnel. - 400 m from the beaches you can walk to the beach! - 5 km of Concarneau, a small town with all services: markets, supermarkets, shops, aquatic center, with 13 km of white sand, Fouesnant-Glénan offers a great range of beaches and coves accessible and suitable for families Beg Meil, Cap coz, Mousterlin, the archipelago Glénan. The landscapes of the tip of Mousterlin are absolutely beautiful, alternating dunes, canals, wet meadows and reed beds where many birds nest and other species living in humid environment. ideal for shore fishing, small sea and the beach of Letty (400m) will seduce you with their shades ranging from deep blue to intense turquoise, assets worth landscapes of the Pacific Islands. The polder of Mousterlin (600m) is a unique site in Europe that extends over 120 hectares surrounded by marsh Mousterlin 479 hectares. This visit is a must to swim the wild atmosphere of Cornwall. Between 1926 and 1946, this land of moor bathed stepmothers of water is reclaimed, following the purchase of some land by a Benac - depriving local farmers and fishermen to use the marsh previously free -to make farmland but they stop in 1960. Part of the marsh was then acquired by the conservatory which opens its rehabilitation in wilderness and preserved for forward into a space observation and environmental education. A path has been realized - Tags oranges- 9 km- to discover in the best conditions this magical haven. also discover Beg-Meil to admire the beautiful mansions of the time when the village was a famous sea resort. Finally a little break on the beautiful beach of Kerler, 4km long, which slopes gently toward the sea, ideal for small children, you can relax with a breathtaking view of the archipelago of Glenans.